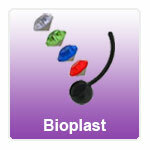 Bioplast is totally flexible making it very comfortable to wear in most body piercings. Bioplast is also available in a range of colours unlike like PTFE and is "pre formed" to the Bioplast belly bars already cave a curve in the shaft. It is biocompatible, so ideal for any one that has an allergic reaction to other materials. "Exactly as advertised, good delivery service"
"Excellent customer service. Items arrived next day."